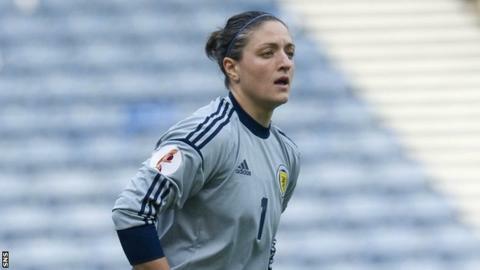 Scotland's lost 2-0 to Canada in their opening game of the Brazil Women's International tournament in Brasilia. Adriana Leon put Canada ahead in the sixth minute and striker Christine Sinclair sealed the win with a fine solo effort after an hour. Scotland skipper Gemma Fay saved a Christine Sinclair penalty eight minutes before the end of the first half. Anna Signeul's side will now take on Brazil on Sunday. After the match, national coach Signeul said that, despite the loss, it was important for her players to gain experience of a high level of football in a world-class tournament. "We came up against a very good Canada side, but this is exactly the kind of test we need," Signeul told the Scottish FA website. "They are physically very strong all over the pitch and we had to work hard from beginning to end. You can tell that they are a top-10 side. "If we want to achieve our ambition of reaching the World Cup finals in Canada in 2015, this is exactly the kind of match we'll need to be ready for. "So, while we are disappointed to lose, I think it was a good experience that focuses the players on the level that we are working to achieve."